Hundreds of students in New Zealand honor a beloved teacher on his retirement by performing the traditional Maori 'haka' war dance. A spokesman for the school told that Mr Adams had been a physics teacher at the school for about 20 years, before swapping to guidance counselling. He worked in the position for 10 years before deciding to retire in April, when the video was filmed. The spokesman described him as a 'beloved' figure at the school, who is sorely missed by students and staff. While the school official said the boys were asked to do the haka, the spirit with which they performed it shows their reverence for him. The spokesman said: 'Mr Adams has a real affinity for young men and has worked tirelessly in all of his roles to remove obstacles to student learning and to help ensure that our young men are able to achieve the best possible academic results. 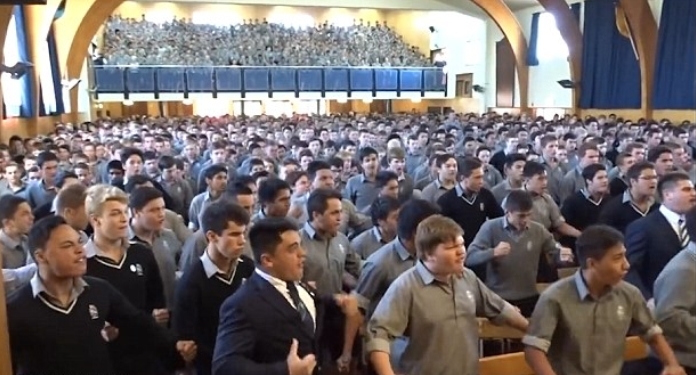 Responses to "Hundreds of Schoolboys Perform Emotional Haka for Beloved Teacher "